What are the more advanced molecular shapes (molecular geometry)? Before taking on this section, make sure you have gone over the completing the octet college section. Those molecular shapes and bond angle beyond Tetrahedral (4 bonds – or electron clouds) are the more advanced shapes. They include shapes like triginal bipyrimidal and octahedral but only make sense if you have explored the electron dot structures (Lewis structures) beyond the octet of 8. You identify these molecular shapes and bond angles from their electron dot structures by counting both the atoms bonded to the central atom and the lone pair electrons of the central atom. 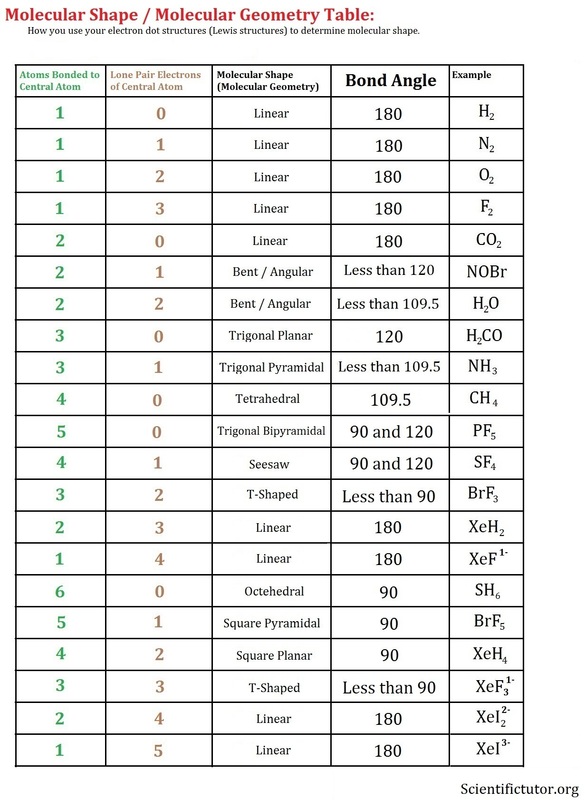 Use the complete molecular shape (molecular geometry) table below to answer the examples and practice problems. Examples: Use the complete molecular shape (molecular geometry) table along with the electron dot structure (Lewis structure) to determine the molecular shape (molecular geometry). VIDEO Molecular Shape from Lewis Structure Examples 2. PRACTICE PROBLEMS: Use the electron dot structure (Lewis structure) to determine the molecular shape (molecular geometry). 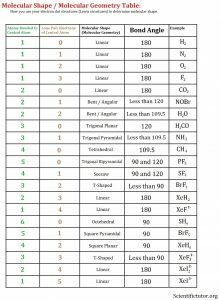 You might need the complete molecular shape (molecular geometry) table.